Dorothy Parker holds a place in history as one of New York's most beloved writers. Now, for the first time in nearly a century, the public is invited to enjoy Mrs. Parker's sharp wit and biting commentary on the Jazz Age hits and flops in this first-ever published collection of her groundbreaking Broadway reviews.Starting when she was twenty-four at Vanity Fair as New York's only female theatre critic, Mrs. Parker reviewed some of the biggest names of the era: the Barrymores, George M. Cohan, W.C. Fields, Helen Hayes, Al Jolson, Eugene O'Neil, Will Rogers, and the Ziegfeld Follies. Her words of praise--and contempt--for the dramas, comedies, musicals, and revues are just as fresh and funny today as they were in the age of speakeasies and bathtub gin. Annotated with a notes section by Kevin C. Fitzpatrick, president of the Dorothy Parker Society, the volume shares Parker's outspoken opinions of a great era of live theatre in America, from a time before radio, talking pictures, and television decimated attendance. 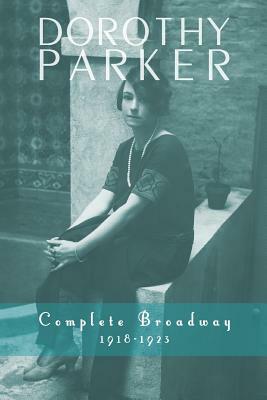 Dorothy Parker: Complete Broadway, 1918-1923 provides a fascinating glimpse of Broadway in its Golden Era and literary life in New York through the eyes of a renowned theatre critic.